Fort Worth » Blog » Water Damage Restoration » Fort Worth Flooding – What Can You Do to Protect Your Home? Most people do not picture Texas as a place that is vulnerable to floods, but it is. The numerous rivers and tributaries running through the state can swell during heavy rain and turn farm fields into oceans. The city of Fort Worth has recently been plagued by severe flooding even from moderate amounts of rain. Residents believe that the spike in floods is being caused by unapproved construction of roads and berms in floodplains. These floodplains are a key component of Fort Worth’s flood control system, and any restructuring of the terrain could obstruct the flow of water and lead to farms, roads, and homes being flooded. City officials state that they can only employ two people to manage the floodplains, so citizens have come together in an effort to get the situation under control. Their biggest task has been to report any unapproved construction in floodplain areas to city officials. I’m sure that Fort Worth is not the only area to struggle with floods due to a lack of oversight on floodplains. I believe that solving these problems would be much easier if citizens would step up and offer solutions like the residents of Fort Worth have done. How Can We Protect Our Homes? There are numerous things that residents can do to protect their own homes from flooding as well. Making sure the roof is in good shape is a very important step. During floods, water does not just enter through the foundation; it also comes in through the roof if leaks are present. Examine your attic ceiling for signs of water damage, and get them fixed before it’s too late. The gutters and downspouts should also be inspected. Make sure they are cleaned regularly. The downspouts should ideally channel the water to a downhill area, where it can flow harmlessly away from the foundation. If your home is located on a low point in the ground, foundation re-grading may be necessary. Water that pools up near the foundation will seep into a leaky basement. Reshaping the land around the house can reduce or eliminate this pooling of rain water. It may be somewhat expensive, but I would imagine that it is much cheaper than constantly dealing with a flooded basement. However, these steps are sometimes not an option for homeowners due to unusual land formations or the expenses involved. In that case, preventing floods and water damage is the best strategy. A sump pump is the most effective way to prevent excessive flood damage in leaky basements. Be sure to inspect your sump pump periodically to ensure that it is working. I would also suggest installing a backup sump pump or a battery backup as well; floods often coincide with power outages, and you do not need a non-functional sump pump adding to your troubles. Most homeowners avoid significant water damage by elevating any important possessions in the basement. I have seen them elevate washers and dryers on cinderblocks or wooden pallets to keep them above the water level. Floods are simply a fact of life in many parts of the country. The damage can be greatly reduced if communities come together to face the problem and individual homeowners take preventative measures. I hope you have found these tips helpful for preventing serious flood damage to your home and possessions. 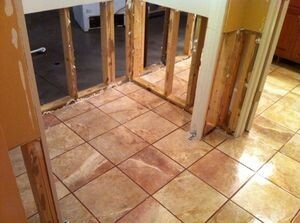 If you do experience serious flooding, I recommend calling a water damage restoration professional right away.